Inside Out is one of those Pixar movies that kids will like because of the colorful graphics, but the story is really meant for adults; it's interesting and also a tearjerker (bring yourself some Kleenex! ), and parts of the story might go over younger kids' heads. Riley (voiced by Kaitlyn Dias) is 11 years old and has led a very happy life in Minneapolis with her mom (Diane Lane) and dad (Kyle MacLachlan). This is due to the emotions inside her head cooperating together and giving her (mostly) happy emotions: Joy (Amy Poehler) tries to have her lead a happy life, while Sadness (Phyllis Smith), Fear (Bill Hader), Anger (Lewis Black), and Disgust (Mindy Kaling) sometimes play a part too. When Riley and her family end up moving to San Francisco, though, things start to get out of whack with her emotions, and Joy and Sadness accidentally end up removed from HQ, and must find their way back, before Riley ends up being unhappy for the rest of her life. This was a very cute movie but also surprisingly sad near the end; I was definitely tearing up. You'll recognize many of the voices playing Riley's emotions - I figured out Hader and Poehler from the start, and I had heard Phyllis Smith's voice before in other movies but wasn't sure of the actresses's name. I saw this movie in 3D, as well, and although it was pretty good in some scenes, I'd recommend seeing it in 2D if you want to save some money. Yes, see this movie, but be aware that even though it's rated PG, there are many scary and emotional moments that younger children may not be able to handle; one scene in particular with a huge clown sticks out as a possibly scary scene for younger kids. 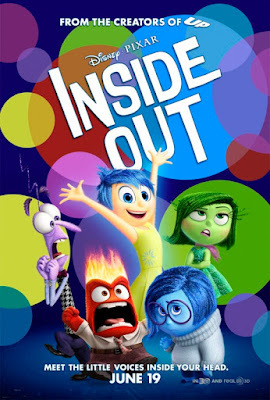 Inside Out is not a movie that I will watch over and over again, but it was a fun one to see in the theater - it reminded me a little bit of Wreck-It Ralph with all of the colorful graphics, and I can say that it's definitely a film that hasn't been done before. Some of my favorite scenes were actually the ones where we got to see the emotions inside the other characters' heads, including Riley's mom and dad; make sure to stay through the credits to see a few end scenes with these, too. Inside Out is in theaters today, June 19th, and is rated PG with a runtime of 94 minutes. 3.5 stars out of 5.